Experiencing a musty odor (a lot like old cheese or the locker room at high school) every time you step into your basement? Commonly caused by molds and bacteria, these odors are a source of introducing Microbial Volatile Organic to your environment. Microbial Volatile Organic compounds, also known as MVOCs are compounds that are developed in the metabolism of a fungi and bacteria. While volatile compounds (VOCs) are chemical with a much lower molecular weight and low water solubility, MVOCs are released into the air as a byproduct of the metabolic process of a decay agent. The off-gassing produced as a result includes alcohols such as carboxylic acids, terpenes, esters and ketones. Whereas the MVOCs produced include: Ethanol, terpenes, geosmin, benzyl cyanide etc. Wondering if Microbial Volatile Organic Compounds can have detrimental effects on your health? In this article we will look into some common sources of MVOCs and discuss how the presence of MVOCs can lead to a series of health complications. Exposure to MVOCs is caused by both: specific activities, products, and through the presence of fungal contaminants in the air (air borne exposure). Human activities that promote development of MVOCs include: smoking and traffic congestion. Whereas, a number of products including building paint materials and certain food can contain MVOCs. Other routes of exposure to MVOCs is triggered by water-damaged environments (specifically indoor environments) and also through coming in contact with mycotoxins present in an indoor setting. “Respirable particles (<1.0 micron) represent the majority of particulate material found in indoor air  and mycotoxins have been found to be present on these indoor particles which include hyphal fragments . Trichothecene mycotoxins have been found to be present in the air of buildings contaminated by Stachybotrys mold,” notes a study on environmental medicine. How To Identify MVOCs In Your Environment? A study focusing on 23 homes revealed that a high level of certain types of MVOCs in basements floors compared to those found of on the main floor of the house didn’t differ a lot in nature. MVOCs range from causing no serious reaction to allergic reactions or cases of serious asthma and neurological complications, and should therefore be taken seriously. Furthermore, another study noted that MVOCs such as 3-methylfuran, 2-heptanone, 1-octen-3-ol, and 2-methylisoborneol are linked to causing asthma amongst individuals; especially those working at schools with a higher presence of airborne fungi in their environment. MVOCs A Possible Cause of Parkinson’s Disease? Over the last few years there has been plenty of back and forth going on in hopes of determining a possible link between MVOCs and Parkinson’s disease. While most claims are made without the support of solid evidence that confirms MVOCs being able to cause the Parkinson disease amongst humans, a study performed on fruit flies at the Rutgers University revealed that MVOCs caused an almost Parkinson’s-like effect. How To Prevent or Control The Development of MVOCs? We strongly believe that prevention is the key. With MVOCs in particular, it is important that you take measures all year round to ensure that your surroundings remain free of stinky, musty odors, and other signs and effects typically associated with MVOCs. 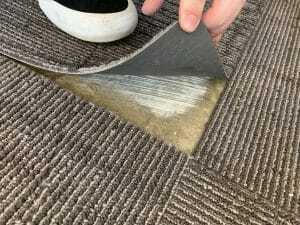 Remove/replace old carpeting with synthetic flooring. Being able to detect the presence of contaminants in your environment is crucial since life-safety concerns can possibly be involved. Determined to keep you and your family safe and ensure that you are surrounded by a healthy environment, we recommend the use of an indoor sampling plan for most residential buildings and encourage you to pay careful attention to any signs that suggest the presence of MVOCs in your home, school, or work environment.